Today I was really impressed by the coffee house community hour. I saw the potential of this community, what we can do when we gather our resources together and our spirit together. I think we can do so many amazing things. So I really am thankful for the people who organized that. Also I thank you for the spirit of generosity. I sensed that yesterday, the spirit of generosity. You know, as you put some of your talents and resources together, we can build this community very well. Many people I would like to thank. Marcelo, thank you very much. It was a generous gift of your arts. At first, you know at the fundraising, thought it wouldn’t get sold very well. But his art, everything was sold and I bought one. I’m amazed at the how you do that, how you do things like that, is it in your brain? It just boggles my mind. I don’t even know how to put on that tag to put on the wall. You gotta help me. So I was quite impressed by that. And then today, we are ordaining three elders, Chris, Michelle and Simon. You are going to define new way of looking at Jesus, looking at church. I think you will define new way’s of doing ministry, not just within the church, but outside of the church. It will bring justice, peace, and also great love of God in a very fresh, new way. I’m very, very looking forward to your leadership for the church. We have nine elders and these are the pillars who will make a difference. Not only in this church but outside for the world. So I’d like to invite all the elders, including three new elders. Stand up for a moment. Can you stand up, please? What is missing? Oh yeah, me too. Okay. These nine people are the ones that you have elected to be your leaders. I am really thankful for their generosity and contribution to making this church a church that defines new history, church that defines new ministry, the church that defines new humanity. I hope that all of us are all together so that we can build. This is a life that God has painted. That is a kind of life that we are going to promote, not the life that world has painted. We have been blinded for so many years. So these are the people who do that. Thank you very much. Leadership is very important. So for that sense, I’d like to share with you about leadership. I chose two people who are the people who made the difference, who define new ministry actually. They are Moses and St. Paul. These two people are not just leaders who maintain, they were not managers who just maintain what is going on, but they’re the ones who brought about new history. Moses brought about new history about Israel, taking them out of Egypt. St. Paul built a church and he was the one who started a new kind of movement. Some people say that Christianity actually began with St. Paul because Jesus never wanted to build new religion in a way. Jesus came to us to teach us about what life should be. St. Paul kind of translated Jesus’ teaching into church’s understanding, so he wrote a half of the New Testament. So he was the one who defined a new ministry. Then also Moses, same thing. So we even think that, for Moses, the Messiah will be like Moses. So these two people I’ve chosen to think about are great leaders. Big people who have influenced, who had a profound influence on many, many people in history. Not just in the church but in history. These two people, when I look at their leadership, it is strange both of them didn’t fit. They didn’t feel that they fit for the ministry. Moses said this “I have never been eloquent, neither in the past, nor even now that you have spoken to your servant, but I’m slow of speech and slow of tongue.” Moses didn’t think that he was fit for the ministry. St. Paul said exactly the same thing, “For I am the least of the apostles unfit to be called an apostle.” These two great leaders felt that they were unfit for the ministry. Then seeing that I realized that Christian leadership is not about my ability or my confidence in my ability. That’s what I realized. Ah, Christian leadership is different. Yes, God wants to bring about changes in the world through the leaders, but not using their capability necessarily. God uses more of their humility than capability. As Christian leaders, we don’t display our own power, strength and ability. We display God’s power, God’s strength and God’s wisdom. We don’t have brilliant ideas or power to do what God wants to do. We often feel overwhelmed. Every day I feel overwhelmed. Every moment I feel unfit for this huge giant work that God wants to do through the church. That’s how I feel almost everyday, so we don’t have within us that capability to do that. Then how does God work to achieve what he wants to do, what he wants to achieve? This is what I realized. God works by changing the leaders themselves. That’s how God works. God works very powerfully, transforming each leader and through that transforming power, he transforms others. That’s how God works. Moses was weak, he felt unfit, he cannot speak, he was ineloquent, he felt. But God works through him with a tremendous transforming power. Same thing with St. Paul. God works through St. Paul with his transforming power. Whoever wants to be the leader has to go through this kind of change through the transforming power of God. They are the leaders. Sometimes, some people misunderstand that our leadership, oh, you know, I work hard, but because I’m a leader now, I don’t need to change. I got to go out and then change other people. That’s not how Christian leadership works. 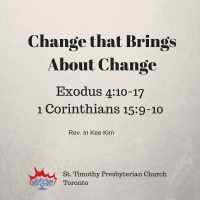 Christian leadership, as we become leaders, we change more and more and more and through that, change occurs. So change is contagious. When I change, my family changes. When I change, my community changes. When I change, the society changes. When I change, the world changes. I may not be able to change others, but I can change. We’re not here to go out and change other people. No one can change anybody else. Only when I change, they change. If parents change, children will change. Don’t try to change your children when you don’t change. Some people say this ridiculous thing, “I don’t go to church but I want you to go to church. I don’t come to church for my sake, I come to church for my children sake.” It doesn’t make sense. When we change, people around me changes. We have Alex here, remember Alex? He once came to TBS, Tuesday Bible study. We were talking about the theology and all that, and this was what he said, and we were all amused and pleasantly surprised by the wisdom of that… “Trying to change somebody, when you yourself don’t go through that change, is violence.” How true that is. He’s right here. Person that gets that wisdom. Try to change somebody when you yourself don’t change, is violence. How much of violence we commit. That’s what Pharisees did. They didn’t want to change. Then ultimately they try to change other people and ultimately killed Jesus. There’s an old gospel song which I used to sing all the time, so we’ll sing it after the sermon. It’s ‘Me, O Lord’. The words go like this, “It’s me, it’s me O Lord, standing in the need of prayer. Not my mother, not my father, but it’s me, O Lord, standing in the need of prayer. Not my brother, not my sister, but it’s me, O Lord, standing in the need of prayer.” It’s me, not anybody else in need of prayer. I think last week, you know, I speak so much these days so I don’t know where I spoke something. Probably here, I think I said that. I said, “You know, being happy is a moral responsibility.” Yeah, being happy is a moral responsibility. When I’m happy, others become happy. When I’m unhappy, we make everybody else miserable. When I change, other people change. When you come home, when you have a bright smile, you make everybody else smile. But when you come home with all this frown, you come home and everybody, all of a sudden, it becomes so dark and depressed. So being happy is a moral responsibility. Change, whatever change happens within me brings about change in other people. Instead of trying to make changes, we let the grace of God work in me, so that same grace may work in other people. This is what St. Paul confessed, “But by the grace of God, I am what I am and His grace towards me has not been in vain. On the contrary, I worked harder than any of them – though it was not I, but the grace of God that is within me.” Real change happens when grace of God works. Not when I work, only when grace of God works, then real change happens. We all feel that we are not good enough. As I shared on Friday, we live in the culture of scarcity. As somebody said, the first thing we say when we wake up is “I didn’t get enough sleep” and the last thing we say as we, as we hit the pillow is “I didn’t get enough done”. As soon as you wake up, until you die, we are not enough. We live in the culture of scarcity. We are thankful because we are changing by the grace of God. We are good enough, you’re good enough, by the grace of God. Michelle, Simon, Chris, you are good enough, by the grace of God. You may feel that I’m unfit for the ministry, but you’re good enough when there is God’s grace. All of us are good enough when God’s grace works within us. That is a spiritual leadership and that kind of leadership only can bring about change deep within a person. We are not interested in institutional change. We are interested in the change of the soul of each person and I’m very thankful for the leadership in this church.